This is an incredible game that Rhett & Link played on their show Good Mythical Morning. You can take a look at the video above for an idea of how the game is played. Here are the basics. Each contestant will have to remake a Christmas Classic by singing it to a royalty free song. I have selected some genres to make it a little more simple for the contestants. We played this game at our staff lunch and it was incredible! 2. List of Christmas Lyrics (Printed). You can find the file HERE. 3. Christmas Songs & Genres (Printed & Cut-out) . You can find the file HERE. 4. Royalty Free Music . You can find the some songs HERE. Print out your lyrics. I printed two sets of each just in case people want to do a duet. Print out the song and genre cards. Cut and fold each card. Place only the Christmas classics in one hat and all the genre cards in another hat. Lay out the lyrics on the front of the stage or on a table. The game is super simple. Bring up as many contestants as you want. We called 8 enthusiastic people up to the front before we explained the game. Just look for someone who isn’t afraid of making a fool of themselves. When you have each player up front explain the game. Each contest must recreate an old Christmas Classic and make it new and awesome using a certain genre of music. 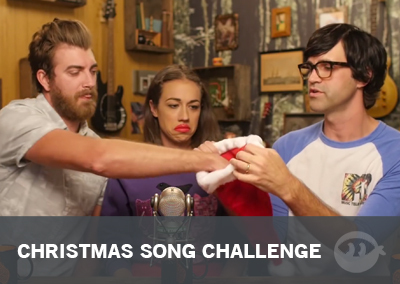 Contestants must select one Christmas Classic from Santa Hat #1 and then choose a Genre from Santa Hat #2. The DJ will cue up the track and the contestant will have about 60 seconds to sell to the crowd that they are the best person to re-invigorate an old Christmas Classic to a new and rocking song! Use crowd applause to crown the winner! Have fun this game is so much fun!